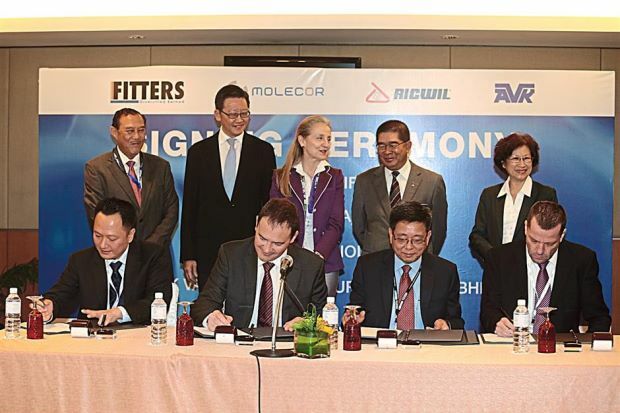 Molecor is entering the Southeast Asia water pipe market after securing a project to manufacture and market orientated PVC (PVC-O) pipes under the “HYPRO” brand.Molecor (SEA) Sdn Bhd is 65% owned by Fitters Diversified Bhd with Ricwil (Malaysia) Sdn Bhd and Molecor Tecnologia SL, holding the remaining 25% and 10% stakes respectively. Molecor Tecnologia developed and patented the molecular orientation technology that gives PVC-O pipes strong mechanical properties and longer service life of up to 50 years. The three parties signed an agreement on March 20, witnessed by the Minister of Energy, Green Technology and Water, Datuk Dr Maximus Ongkili during Asia Water 2014 exhibition held from March 19-21 in Kuala Lumpur, Malaysia. 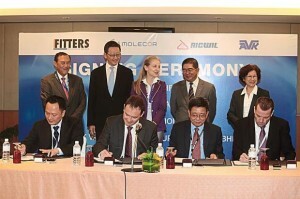 The company is also investing about RM80 million in capital expenditure (CAPEX) to set up the first phase of its PVC-O manufacturing facility in Gebeng, Kuantan, Malaysia. Manufacturing operations are planned to begin by the fourth quarter of 2014. The plant will initially have three production lines with a total installed capacity of up to 11,000 metric tons (MT) per year. Its subsequent phase would double the production. The group plans to expand its production capacity over the next three years and a half locally as well as in Thailand and Indonesia. The business will largely serve Governments and township developers for both pipe-laying and pipe-replacement. The group is pending its SIRIM and National Water Services Commission (SPAN) certifications, expected to be obtained next month. PVC-O pipes, which are manufactured in compliance with international standards, are resistant to corrosion and natural chemical substances that ensure consistent fluid quality, ideal to distribute high pressure water from water treatment plants for industrial and household usage, according to Molecor.